International Contracting. Law and Practice, in its fourth revised and expanded edition, describes the new and ever-changing concepts and procedures that continue to redefine the researching, drafting, and execution of international contracts. For well over a decade this prized guide has served practitioners handling the legal ramifications of international contracting projects. More profoundly, it takes fully into account the hugely increasing volume of international trade, its ongoing expansion into more and more countries worldwide, and the concomitant need for businesspersons and transactional lawyers to be aware of the numerous recent international conventions and supranational responses to facilitate trade. All the invaluable features of earlier editions are still here, including analysis of key contract issues unique to various types of contracting, common contract clauses (such as choice of law and dispute resolution clauses), contract checklists, insights gleaned from actual cases and arbitral proceedings, and clear explanation of the principles of good contract drafting. The major relevant international conventions, model laws, pertinent national laws, legal guides, and other documents and instruments are all covered, with primary texts provided in appendices. confidentiality, nondisclosure agreements, and covenants not to compete. 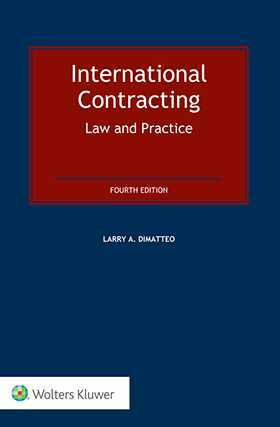 This book presents detailed negotiating strategies, sample contract clauses, drafting “tips,” contract checklists, and case studies and provides easy access to the myriad of issues and solutions related to the drafting of international contracts. This one-volume book balances “law” and “practice” by providing practical advice for carrying out successful international business transactions, as well as surveying substantive national, regional, and international laws. More than merely an accessible reference that can be used as a framework tool in the negotiating and drafting of international contracts, this volume offers expert insights regarding the reasonableness of many contract clauses and the likelihood of their enforcement in a foreign jurisdiction. Since knowledge of the nuances of international transactional law cannot be overstated, this book is not only valuable but also necessary. An adroit combination of contract theory and contract practice, the book continues to provide guidance to the law practitioner and student alike.